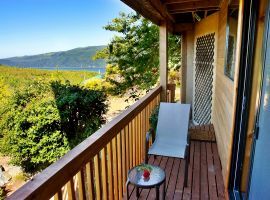 This suite has a West Coast theme with views of the San Juan Inlet and Pacific Ocean. 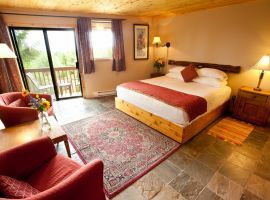 This large suite is furnished with a King bed, a sitting area and coffee table. 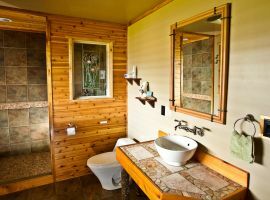 It is tiled with natural slate throughout and features a natural stone walk-in shower, and unique natural stone counter. This suite also has a walkout balcony and separate entrance. Comfortably sleeps 2 people. Not suitable for children under 3.